It’s been said that “knowledge is power” and it is true. We are emboldened when we possess the knowledge of a topic or situation. Why then should we feel fear? Wouldn’t it be great if by simply having the knowledge necessary to obtain a desired outcome, we could act boldly and achieve our desired results? 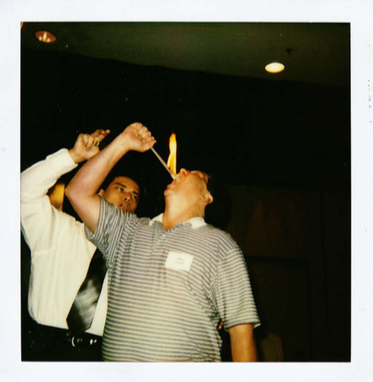 Some years ago I attended a seminar where we were taught how to eat fire. It’s a simple task that includes suffocating the fire in your mouth long enough to extinguish the flame. Of the hundreds of people in the room, every on executed the task without incident. And so did I. But that doesn’t mean I wasn’t scared. Many years earlier I engaged in a dumb challenge at a bar with some friends. The challenge was putting matches in our mouth and striking them to light them. The person who was able to strike the most would have his bar tab retired by the others. It’s funny what we’ll do for a few free drinks. Actually, it’s dumb. I took an entire matchbook and when it went up in flames, so did my upper and lower lips. It took a couple of weeks of aloe treatments to get back to normal. And thoughts of that past pain came back when I saw the flaming cotton ball at the end of the stick I was about to eat. All I could think of was how much it hurt to burn my lips, how much pain I endured, and how much embarrassment I suffered. Now I was about to do something similar that could have the same result. And this time, not only did I possess the knowledge of the pain; I was sober too! I could have allowed the previous experience to prevent me from a successful result. I could have been one person in the room that was too afraid to do what we’d been taught to do. Who knows, if I had not eaten the fire that day maybe others would have allowed my fear to expose their fear. Perhaps I would have prevented someone else from achieving his or her goal with my fear. But I overcame my fear. I realized that I now possessed new knowledge. I knew exactly how it would work this time if I only followed the process. And I did. How did I overcome the fear? I focused on what I knew I needed to do and ignored that which I didn’t want to do. As we make changes it is important to remember that we must act proactively with confidence in our new knowledge. If we’re trying to avoid mistakes of the past while trying to employ knowledge of the future, fear will hold us back and we’ll fail to act, or worse, we’ll pull back with catastrophic results. As the flaming cotton ball approached my mouth or as it was inside, had I remembered the pain I experienced before, I might have opened my mouth, exhaled, and given more fuel to the fire. I would have not only burned my lips but likely the inside of my mouth and much of my face too. We must act boldly and confidently in the knowledge we’ve gained. Change is at hand. We know what to do and all we must do is do it. But that doesn’t mean we’re not scared.